Not to be confused with InSight or Insite. Representation of the Duncker Candle Problem. In psychology, insight occurs when a solution to a problem presents itself quickly and without warning. It is the sudden discovery of the correct solution following incorrect attempts based on trial and error. Solutions via Insight have been proven to be more accurate than non-insight solutions. Insight was first studied by Gestalt Psychology, in the early part of the 20th century, during the search for an alternative to associationism and the associationistic view of learning. Some proposed potential mechanisms for insight include: suddenly seeing the problem in a new way, connecting the problem to another relevant problem/solution pair, releasing past experiences that are blocking the solution, or seeing problem in a larger, coherent context. Solution to the Nine Dot problem. Generally, methodological approaches to the study of insight in the laboratory involve presenting participants with problems and puzzles that cannot be solved in a conventional or logical manner. Problems of insight commonly fall into three types. Example of an RAT problem. The first type of problem forces participants to use objects in a way they are not accustomed to (thus, breaking their functional fixedness), like the "Duncker candle problem". In the "Duncker candle problem", individuals are given matches and a box of tacks and asked to find a way to attach a candle to the wall to light the room. The solution requires the participants to empty the box of tacks, set the candle inside the box, tack the box to the wall, and light the candle with the matches. 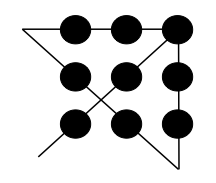 The second type of insight problem requires spatial ability to solve, like the "Nine-dot Problem". The famous "Nine-dot problem" requires participants to draw four lines, through nine dots, without picking their pencil up. The third and final type of problem requires verbal ability to solve, like the Remote Associates Test (RAT). In the RAT, individuals must think of a word that connects three, seemingly unrelated, words. RAT are often used in experiments, because they can be solved both with and without insight. Two clusters of problems, those solvable by insight and those not requiring insight to solve, have been observed. An individual’s cognitive flexibility, fluency, and vocabulary ability are predictive of performance on insight problems, but not on non-insight problems. In contrast, fluid intelligence is mildly predictive of performance on non-insight problems, but not on insight problems. People in a better mood are more likely to solve problems by insight. Research demonstrated that self-reported positive affect of participants uniquely increased insight before and during the solving of a problem, as indicated by differing brain activity patterns. People experiencing anxiety showed the opposite effect, and solved fewer problems by insight. Using a geometric and spatial insight problem, it was found that providing participants with breaks improved their performance as compared to participants who did not receive a break. However, the length of incubation between problems did not matter. Thus, participants' performance on insight problems improved just as much with a short break (4 minutes) as it did with a long break (12 minutes). Research has shown sleep to help produce insight. Individuals were initially trained on insight problems. Following training, one group was tested on the insight problems after sleeping for eight hours at night, one group was tested after staying awake all night, and one group was tested after staying awake all day. Those that slept performed twice as well on the insight problems than those who stayed awake. Differences in brain activation in the left and right hemisphere seem to be indicative of insight versus non-insight solutions. Using RAT’s that were either presented to the left or right visual field, it was shown that participants having solved the problem with insight were more likely to have been shown the RAT on the left visual field, indicating right hemisphere processing. This provides evidence that the right hemisphere plays a unique role in insight. fMRI and EEG scans of participants completing RAT's demonstrated unique brain activity corresponding to problems solved by insight. For one, there is high EEG activity in the alpha- and gamma-band about 300 milliseconds before participants indicated a solution to insight problems, but not to non-insight problems. Additionally, problems solved by insight corresponded to increased activity in the temporal lobes and mid-frontal cortex, while more activity in the posterior cortex corresponded to non-insight problems. The data suggests there is something different occurring in the brain when solving insight versus non-insight problems that happens right before the solving of the problem. This conclusion has been supported also by eye traking data which shows an increased eye blink duration and frequency when people solve problems via Insight. This latter result, paired with an eye pattern oriented to look away from sources of visual inputs ( such as looking at blank wall, or out the window at the sky )proves different attention involvement in Insight problem solving vs problem solving via anlaysis. It was found that groups typically perform better on insight problems (in the form of rebus puzzles with either helpful or unhelpful clues) than individuals. Example of a rebus puzzle. Answer: man overboard. Additionally, while incubation improves insight performance for individuals, it improves insight performance for groups even more. Thus, after a 15-minute break, individual performance improved for the rebus puzzles with unhelpful clues, and group performance improved for rebus puzzles with both unhelpful and helpful clues. Personality and gender, as they relate to performance on insight problems, was studied using a variety of insight problems. It was found that participants who ranked lower on emotionality and higher on openness to experience performed better on insight problems. Men outperformed women on insight problems, and women outperformed men on non-insight problems. Individuals are poorer at predicting their own metacognition for insight problems, than for non-insight problems. Individuals were asked to indicate how "hot" or "cold" to a solution they felt. Generally, they were able to predict this fairly well for non-insight problems, but not for insight problems. This provides evidence for the suddenness involved during insight. Recently, insight was studied in a non-laboratory setting. Accounts of insight that have been reported in the media, such as in interviews, etc., were examined and coded. It was found that insights that occur in the field are typically reported to be associated with a sudden "change in understanding" and with "seeing connections and contradictions" in the problem. It was also found that insight in nature differed from insight in the laboratory. For example, insight in nature was often rather gradual, not sudden, and incubation was not as important. Studies on primate cognition have provided evidence of what may be interpreted as insight in animals. In 1917, Wolfgang Köhler published his book The Mentality of Apes, having studied primates on the island of Tenerife for six years. In one of his experiments, apes were presented with an insight problem that required the use of objects in new and original ways, in order to win a prize (usually, some kind of food). He observed that the animals would continuously fail to get the food, and this process occurred for quite some time; however, rather suddenly, they would purposefully use the object in the way needed to get the food, as if the realization had occurred out of nowhere. He interpreted this behavior as something resembling insight in apes. There are a number of theories representing insight; at present, no one theory dominates interpretation. According to the dual process theory, there are two systems used to solve problems. The first involves logical and analytical thought processes based on reason, while the second involves intuitive and automatic processes based on experience. Research has demonstrated that insight probably involves both processes; however, the second process is more influential. According to the three-process theory, intelligence plays a large role in insight. Specifically, insight involves three different processes (selective encoding, combination, and comparison), which require intelligence to apply to problems. Selective encoding is the process of focusing attention on ideas relevant to a solution, while ignoring features that are irrelevant. Selective combination is the process of combining the information previously deemed relevant. Finally, selective comparison is the use of past experience with problems and solutions that are applicable to the current problem and solution. According to the four-stage model of insight, there are four stages to problem solving. First, the individual prepares to solve a problem. Second, the individual incubates on the problem, which encompasses trial-and-error, etc. Third, the insight occurs, and the solution is illuminated. Finally, the verification of the solution to the problem is experienced. Since this model was proposed, other similar models have been explored that contain two or three similar stages. In psychology and psychiatry, insight can mean the ability to recognize one's own mental illness. This form of insight has multiple dimensions, such as recognizing the need for treatment, and recognizing consequences of one's behavior as stemming from an illness. A person with very poor recognition or acknowledgment is referred to as having "poor insight" or "lack of insight". The most extreme form is anosognosia, the total absence of insight into one's own mental illness. Many mental illnesses are associated with varying levels of insight. For example, people with obsessive compulsive disorder and various phobias tend to have relatively good insight that they have a problem and that their thoughts and/or actions are unreasonable, yet are compelled to carry out the thoughts and actions regardless. Patients with Alzheimer's disease, schizophrenia, and various psychotic conditions tend to have very poor awareness that anything is wrong with them. "Insight" can also refer to other matters in psychology; problem solving behavior requiring insight is the subject of insight phenomenology. An insight is the derivation of a rule which links cause with effect. The mind is a model of the universe built up from insights. A mature mind has assimilated many insights and represents a sophisticated model of the universe. The mind-model might be inaccurate. When insight is not subordinate to a validation discipline like the 'scientific method', 'fallacious' thinking can result in a confused mind. Intuition, which is often described in the popular literature as an alternative thought process, is merely another manifestation of insight. In this process, multiple bits of seemingly unrelated data are linked together and a hypothesis or plan of action is generated. Usually this process is generated in a novel situation. Such a circumstance links data which had previously seemed unrelated. The categories and analytical process, however, are not distinct from any other form of insight. The only difference is the degree of novelty of the stimulus. The Pali word for "insight" is vipassana, which has been adopted as the name of a kind of Buddhist mindfulness meditation. Recent research indicates that mindfulness meditation does facilitate solving of insight problems with dosage of 20 minutes. People with distinct political orientations also differ in problem-solving strategy. Liberals solve more problems via insight instead of in a step-by-step analytic fashion. Pat Conroy points out that an insight is a statement based on a deep understanding of your target consumers' attitudes and beliefs, which connect at an emotional level with your consumer, provoking a clear response (This brand understands me! That is exactly how I feel! — even if they've never thought about it quite like that) which, when leveraged, has the power to change consumer behavior. Insights must effect a change in consumer behavior that benefits your brand, leading to the achievement of the marketing objective. An observation or a wish, e.g. "I would like to ...."
A motivation explaining the wish, e.g. " because ..."
A barrier preventing the consumer from being satisfied with the fulfillment of his/her motivation, e.g. " but..."
The gap between the second and the third term offers a tension, which constitutes a potential for a brand. Like there are concept writers for copies, there are insight writers. In technical terminology of insight in market research is the understanding of local market by referring different source of information (such as quantitative research and qualitative research) proving for the consumers' insight. 1 2 Duncker, Karl; Lees, Lynne S. (1 January 1945). "On problem-solving". Psychological Monographs. 58 (5): i–113. doi:10.1037/h0093599. ↑ Robinson-Riegler, Bridget Robinson-Riegler, Gregory. Cognitive psychology : applying the science of the mind (3rd ed.). Boston: Pearson Allyn & Bacon. ISBN 978-0-205-03364-5. ↑ Weiten, W.; McCann, D. (2007). Themes and Variations. Nelson Education ltd: Thomson Wadsworth. ISBN 978-0176472733. 1 2 3 4 5 6 7 8 9 10 11 Sternberg, Edited by Robert J.; Davidson, Janet E. (1996). The nature of insight (Reprint. ed.). Cambridge, MA; London: The MIT Press. ISBN 0-262-69187-6. 1 2 Sloan, Sam Loyd; with an introduction by Sam (2007). Cyclopedia of puzzles. Bronx, N.Y.: Ishi Press International. ISBN 0-923891-78-1. ↑ Mednick, Sarnoff (1 January 1962). "The associative basis of the creative process". Psychological Review. 69 (3): 220–232. doi:10.1037/h0048850. 1 2 3 4 Kounios, John; Beeman, Mark (1 August 2009). "The Aha! Moment: The Cognitive Neuroscience of Insight". Current Directions in Psychological Science. 18 (4): 210–216. doi:10.1111/j.1467-8721.2009.01638.x. 1 2 3 Gilhooly, KJ; Murphy, P (1 August 2005). "Differentiating insight from non-insight problems". Thinking & Reasoning. 11 (3): 279–302. doi:10.1080/13546780442000187. 1 2 3 Subramaniam, Karuna; Kounios, John; Parrish, Todd B.; Jung-Beeman, Mark (1 March 2009). "A Brain Mechanism for Facilitation of Insight by Positive Affect". Journal of Cognitive Neuroscience. 21 (3): 415–432. doi:10.1162/jocn.2009.21057. PMID 18578603. 1 2 Segal, Eliaz (1 March 2004). "Incubation in Insight Problem Solving". Creativity Research Journal. 16 (1): 141–148. doi:10.1207/s15326934crj1601_13. 1 2 Wagner, Ullrich; Gais, Steffen; Haider, Hilde; Verleger, Rolf; Born, Jan (22 January 2004). "Sleep inspires insight". Nature. 427 (6972): 352–355. doi:10.1038/nature02223. PMID 14737168. 1 2 Bowden, Edward M.; Jung-Beeman, Mark (1 September 2003). "Aha! Insight experience correlates with solution activation in the right hemisphere". Psychonomic Bulletin & Review. 10 (3): 730–737. doi:10.3758/BF03196539. ↑ Salvi, Carola; Bricolo, Emanuela; Franconeri, Steven; Kounios, John; Beeman, Mark (December 2015). "Sudden insight is associated with shutting out visual inputs". Psychonomic Bulletin & Review. 22 (6): 1814–1819. doi:10.3758/s13423-015-0845-0. 1 2 3 Smith, C. M.; Bushouse, E.; Lord, J. (13 November 2009). "Individual and group performance on insight problems: The effects of experimentally induced fixation". Group Processes & Intergroup Relations. 13 (1): 91–99. doi:10.1177/1368430209340276. 1 2 3 4 5 6 Lin, Wei-Lun; Hsu, Kung-Yu; Chen, Hsueh-Chih; Wang, Jenn-Wu (1 January 2011). "The relations of gender and personality traits on different creativities: A dual-process theory account". Psychology of Aesthetics, Creativity, and the Arts. 6 (2): 112–123. doi:10.1037/a0026241. 1 2 Metcalfe, Janet; David Wiebe (1987). "Intuition in insight and noninsight problem solving". Memory & Cognition. 15 (3): 238–246. doi:10.3758/BF03197722. 1 2 3 Klein, G.; Jarosz, A. (17 November 2011). "A Naturalistic Study of Insight". Journal of Cognitive Engineering and Decision Making. 5 (4): 335–351. doi:10.1177/1555343411427013. ↑ Köhler, Wolfgang (1999). The mentality of apes (Repr. ed.). London: Routledge. ISBN 0-415-20979-X. 1 2 3 4 5 Davidson, J. E.; Sternberg, R. J. (1 April 1984). "The Role of Insight in Intellectual Giftedness". Gifted Child Quarterly. 28 (2): 58–64. doi:10.1177/001698628402800203. 1 2 3 4 5 Hadamard, Jacques (1975). An essay on the psychology of invention in the mathematical field (Unaltered and unabridged reprint of the enlarged (1949) ed.). New York, NY: Dover Publ. ISBN 978-0-486-20107-8. ↑ Marková I. S. (2005) Insight in Psychiatry. Cambridge, Cambridge University Press. ↑ Pijnenborg, G.H.M. ; Spikman, J.M. ; Jeronimus, B.F.; Aleman, A. (2012). "Insight in schizophrenia: associations with empathy". European Archives of Psychiatry and Clinical Neuroscience. 263 (4): 299–307. doi:10.1007/s00406-012-0373-0. PMID 23076736. ↑ Ghaemi, S. Nassir (2002). Polypharmacy in Psychiatry. Hoboken: Informa Healthcare. ISBN 0-8247-0776-1. ↑ Markova, I S; Jaafari, N; Berrios, G E (2009). "Insight and Obsessive-Compulsive Disorder: A conceptual analysis". Psychopathology. 42 (5): 277–282. doi:10.1159/000228836. PMID 19609097. ↑ Marková, I. S.; Berrios, G. E.; Hodges, J H (2004). "Insight into Memory Function". Neurology, Psychiatry & Brain Research. 11: 115–126. ↑ Giannini, AJ; Daood, J; Giannini, MC; Boniface, RS; Rhodes, PG (1978). "Intellect versus intuition—a dichotomy in the reception of nonverbal communication". Journal of General Psychology. 99: 19–25. doi:10.1080/00221309.1978.9920890. ↑ Giannini, AJ; Barringer, ME; Giannini, MC; Loiselle, RH (1984). "Lack of relationship between handedness and intuitive and intellectual (rationalistic) modes of information processing". Journal of General Psychology. 111: 31–37. doi:10.1080/00221309.1984.9921094. ↑ Ren, Jun; Huang, ZhiHui; Luo, Jing; Wei, GaoXia; Ying, XiaoPing; Ding, ZhiGuang; Wu, YiBin; Luo, Fei (29 October 2011). "Meditation promotes insightful problem-solving by keeping people in a mindful and alert conscious state". Science China Life Sciences. 54 (10): 961–965. doi:10.1007/s11427-011-4233-3. PMID 22038009. ↑ Salvi, Carola; cristofori, Irene; Beeman, Mark; Grafman, Jordan. "The Politics of Insight". Quarterly Journal of Experimental Psychology. 6: 1064–1072. doi:10.1080/17470218.2015.1136338. PMC 4869693 .